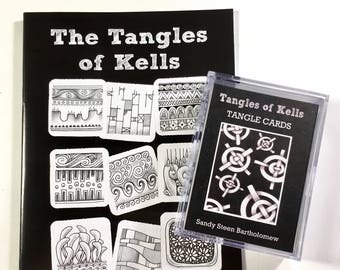 A pack of 40 cards with tangles/patterns from my book, "The Tangles of Kells". The back of each card has steps (instructions) for a tangle and the front has a sample piece of art using that tangle. 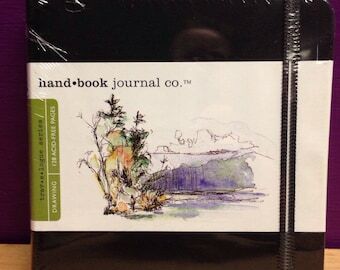 Each pack also has a few blank cards for recording other tangles. The cards come in a clear, two-piece box designed to store and protect the cards. 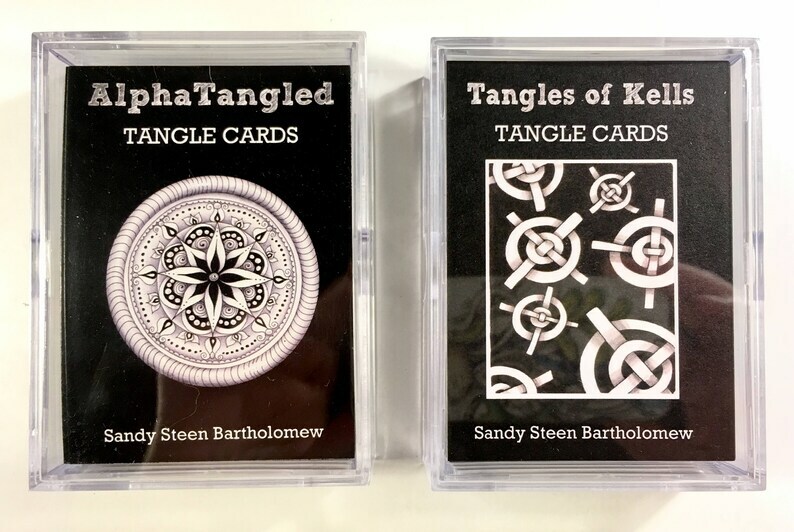 This collection features the art and tangles included in the "Tangles of Kells" In-App-Purchase from my "Tangle Library" App. Since the App is only available for iPhone/iPad, these cards are perfect for non-techies and Android users as well as those who just prefer to use tangible references. These cards are self-published, but play well with all my other card packs. 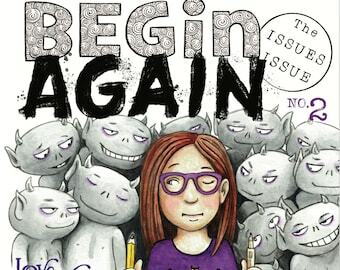 These are great, fun to see the variety and the step outs are so helpful! I love this. I am so glad you made cards out of it Sandy. This is fantastic! So happy I found. It reminds me a bit of a Moleskine Passion Journal but bigger and more configurable. Would love a spiral/ lay-flat version of this. Shipping was fast and well packaged. I truly hope you continue to produce as this could be a yearly or twice yearly purchase. Thanks so much! Payment through PayPal is expected at time of purchase. You may also pay with a credit card. If an item is not as it appears on my shop page, you may return it for a full refund. Please be sure to study the pictures and email any questions before buying. Custom items, or signed items are not returnable. Packages are shipped through the US Postal Service, first-class or Priority Mail, unless otherwise stated. Items will be shipped within three days from purchase date unless assembly is necessary (ie: rubber stamps). 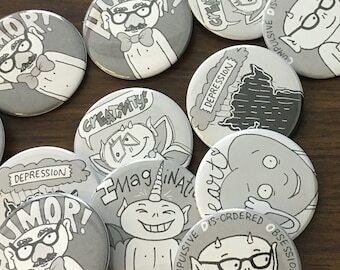 These items will ship within the week. Please let me know if you need items in a hurry! Some items are available at wholesale for brick and mortar stores or certified Zentangle teachers only.